II. Also inscribed at the lower right: Ant. Sal. exc. III. With Carlo Losi address and the date 1773 (see Davis, 1988, 81, as very pale). 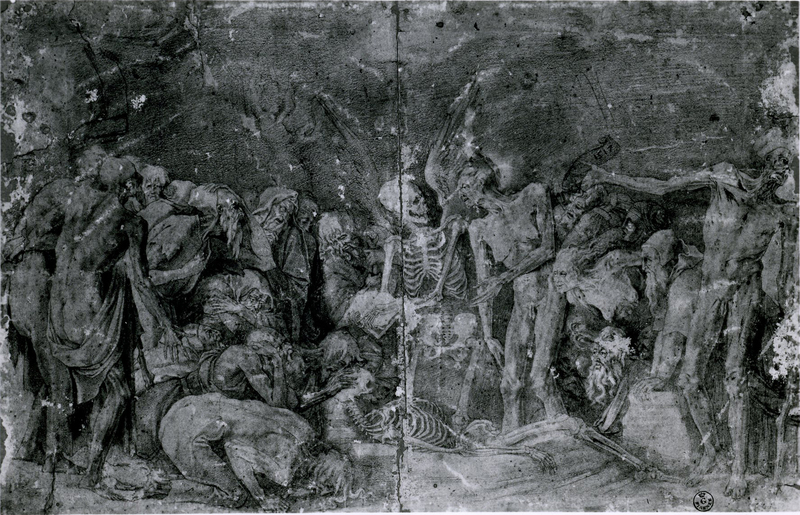 Heinecken, I, 1778, 648, II, 1788, 95, as after another drawing by Bandinelli than the one used by Agostino Veneziano. Bartsch, XIV, 1813, 321, 425. Le Blanc, 1854-1890, II, 112, 31, as after Bandinelli. Passavant, VI, 1864, 71, 54. COLLECTIONS: (All State I except where noted). Bologna, Inv. D.41 (190) (trimmed and pieces missing at edges). Chatsworth, vol. 2, no. 74. Florence, 692ss, and 693ss (poor). Hamburg, inv. no. 523. London, Vol C.53, p.34. Los Angeles (Ruiz; Schab, 1986, 4, Fig., 32, no. 22). Whitworth Art Gallery, University of Manchester (28.8 x 43.8; Between Renaissance and Baroque, 1965, 122, no. 422). New York, 17.50.10 (brilliant impression), and 66.747.47 (II, weak, with the R altered to Ruphel). Oxford, Ashmolean. Paris, Eb 6 Rés. Fol., p.59 (II). Nagler, XII, 1842, 336-337, no. 82, as Dente after Bandinelli, as made from a drawing other than the one Agostino Veneziano worked from, and perhaps earlier. Le Blanc, 1854-1890, II, 112, no. 31, as Dente after Bandinelli. Ferri-Olschki, 1917, under no. 14, as by Marco Dente and made from Bandinelli’s pen copy, Uffizi 14699F, of Rosso’s drawing. Kusenberg, 1931, 157, 163, no. 422, as Dente’s copy of Agostino Veneziano’s print. Petrucci, 1964, 31. Poirier, 1964, 55. Between Renaissance and Baroque, 1965, 122, no. 422 (Manchester), as Dente after Rosso. Ferrara and Gaeta Bertelà, 1975, no. 266, and Fig. (Bologna), as Dente after Bandinelli. Borea, 1979, 365, n. 54, as derived from Uffizi drawing 14669F (by Bandinelli?). Borea, 1980, 247, no. 609, 246, Fig. (Florence, 692ss), with a discussion of its relation to Agostino Veneziano’s print and to Uffizi drawing 14669F, and with the comment that with its landscape details Dente’s print is more faithful to Rosso’s design. Dacos, 1984, 353, 356, Fig. 349, 361, n. 45, as probably after a lost drawing by Pedro Machuca based on Rosso’s composition. G. Werner, in Zauber der Medusa, 1987, 290, no. VI, 23, Fig. (Hamburg), as after Agostino Veneziano’s print. Carroll, 1987, 57, 58, n. 12, under no. 2, as copied not from Agostino Veneziano’s print but from a pen and ink copy of Rosso’s drawing. Davis, 1988, 80, Fig. (Los Angeles), 81, no. 22, 167, 195, as done between 1524 and 1527. 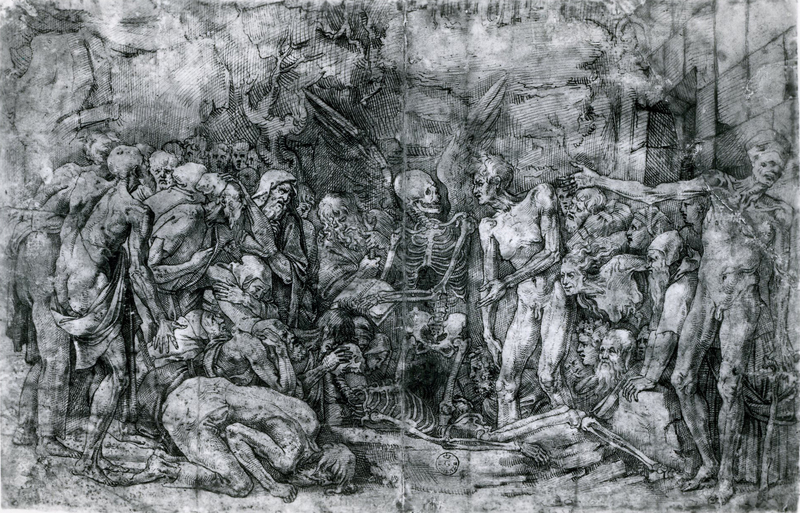 This engraving is in reverse of Rosso’s drawing (Fig.D.1a), which is the disegno di stampa for Agostino Veneziano’s engraving of 1518 (Fig.E.109a). But Dente’s print appears to have been made from another drawing, Uffizi 14669F (Fig.D.1 Copy, Florence), discussed under E.109. 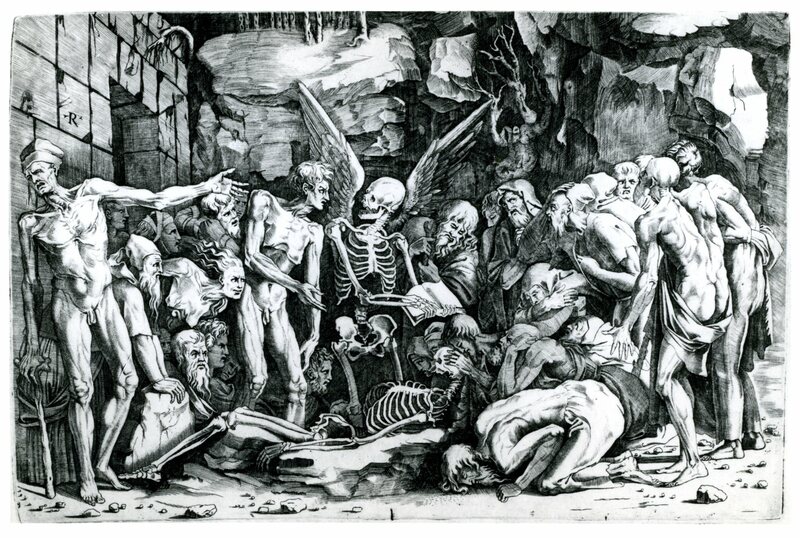 This pen and ink copy of Rosso’s drawing has been falsely attributed to Bandinelli. 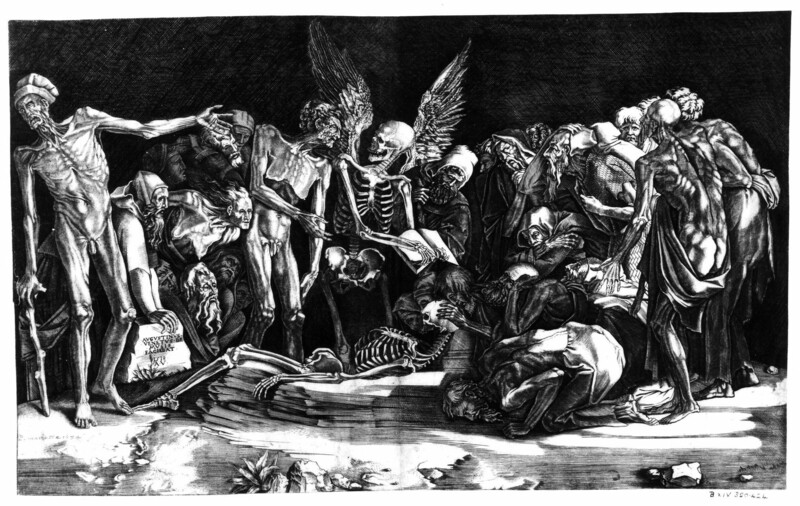 It was almost certainly made as the model for Marco Dente’s print and could have been made by the engraver himself. There is some possibility that the slight indications of trees and rocks in Rosso’s drawing, which do not appear in Agostino’s engraving, were added by Marco Dente in anticipation of his even greater elaboration of the background in the pen and ink drawing and in his engraving. For other differences between Rosso’s drawing and the pen drawing, see D.1. When Dente made his print, he eliminated a few details found in the pen drawing and added a few others, such as some of the rocks in the foreground. By its elaborations, Dente’s print preserves Rosso’s image less faithfully than Agostino’s engraving, although Borea thought otherwise. 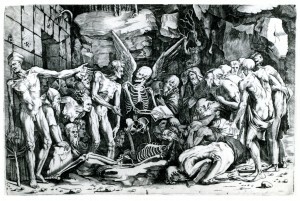 The total effect of Dente’s print is also less specifically macabre, and less detailed in its description of the old figures it shows than is Agostino’s engraving and Rosso’s drawing. Because of the R inscribed on the print, it has always been recognized as by Marco Dente da Ravenna. Nagler, believing the composition was by Bandinelli, as did Passavent, thought that Dente’s print was earlier and made from a less finished drawing than the one used by Agostino Veneziano. 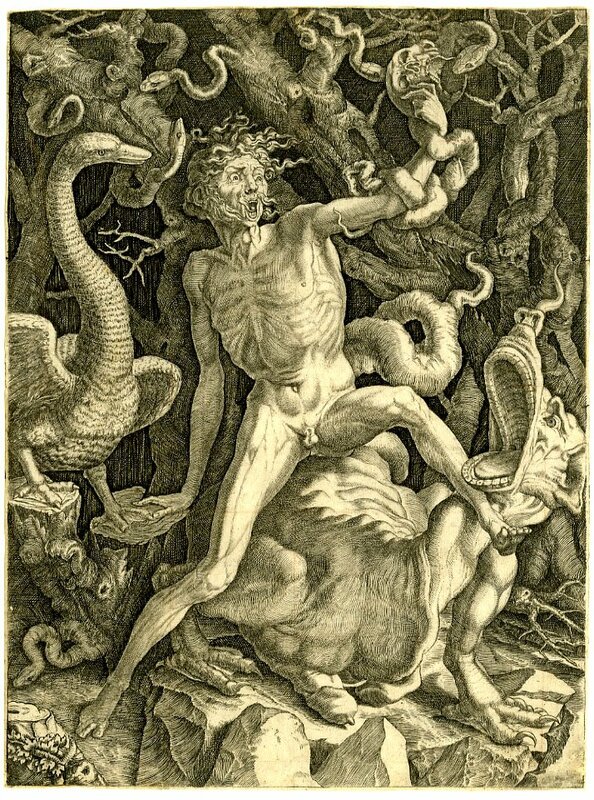 (Heinecken and Bartsch also thought that Dente’s print was done after another drawing, again by Bandinelli.) But it is reasonable to assume that Dente’s print was made later than Agostino’s of 1518 and made because of the success of the latter. Its exact or even approximate date has not been determined. I have wondered if it might have been done just about the time that Rosso designed his Fury, engraved by Caraglio apparently in 1524 (Fig.E.18a). Dente died in 1527. COPY? : Heinecken, II, 1788, 96, under b., indicates another version of this print: “avec la diférence que le fond, outre la muraille & une porte qui est à gauche, représente une espace de rocher…” This seems to describe the print catalogued here of which I have never seen another version. 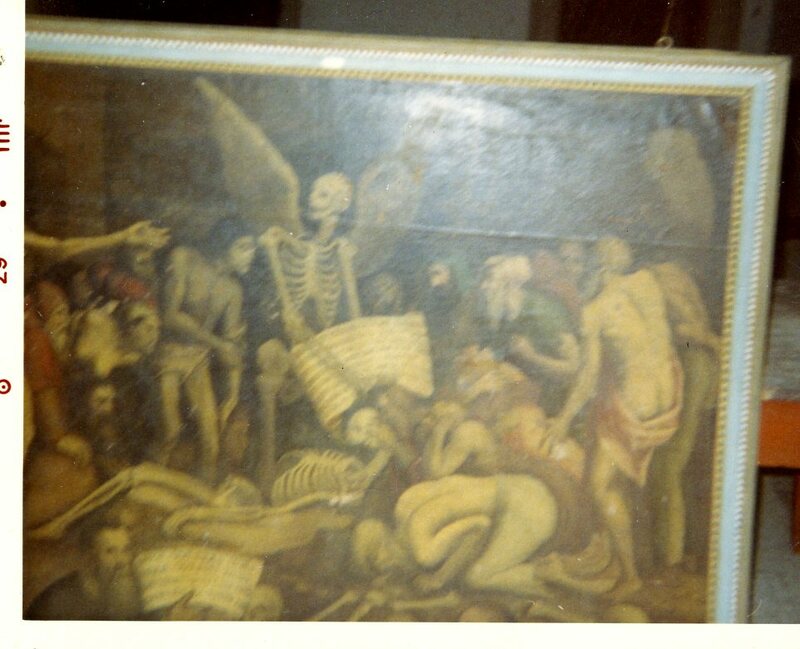 COPY, PAINTING: Vallambrosa, Monastery, Inventario dello Stato 1141. LITERATURE: Borgo, 1968 (1876), 68, n. 19, and Fig. 203 (Fig.Vallambrosa). INQUIRE PACEM ET PERSEQUERE EAM. (12 Come, children, hearken to me: I will teach you the fear of the Lord. 13 Who is the man that desireth life: who loveth to see good days? 14 Keep thy tongue from evil, and thy lips from speaking guile. The late Professor Benjamin Kohl identified this passage for me. (You were dead before you were living; You are dead prior to living; It has always been so and always shall I have the same destiny.) I should like to thank Lily Beck for the translation of this passage.